Afghanistan's independent human rights commission says violence against women has increased over the past year. The commission says it has recorded 265 cases of forced marriage and 165 cases of self-immolation, where women deliberately set fire to themselves. In both cases the numbers are higher than those recorded previously. 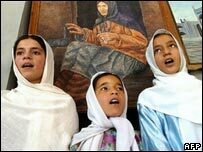 The new Afghan constitution drawn up after the fall of the Taleban in 2001 is supposed to protect women but millions still face discrimination. The rights commission says that even as many people in the country are faced with a worsening security situation, women are having to deal with increased cases of domestic violence. It says that many continue to be forced into marriages against their will. Last year it recorded 265 such cases, an increase from the previous year. The commission says that more than half of the women in question are married under the legal age of 18-years-old. Experts say poverty often drives families to marry off their daughters to older, wealthier men. In some instances, women are handed over to resolve a community dispute. To escape this situation many women commit suicide by burning themselves. The commissioners recorded 165 cases of self-immolation in 2007. Although these are nationwide figures, it says the actual numbers could be higher. A new law against domestic violence and forced marriage has been drafted and is to be debated in parliament. But previous steps such as laws to fight discrimination and under-age marriage have done little to stop the trend, especially in the villages.